Genesis Vision will be launching an ICO campaign to help fuel its development, beginning in October. Amidst a rapid growth in the trust management market, market disruptor, Genesis Vision is primed to launch. The versatile platform will be powered by an Initial Coin Offering (ICO) to support its development, which will begin as early as October 15, 2017. While Genesis Vision reflects an unconventional trust management system, the new platform will feature state-of-the-art scientific and technical knowledge that will be disruptive to the financial services industry. 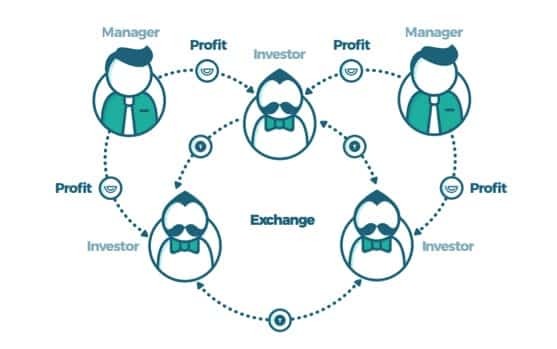 More specifically, it will unite exchanges, brokers, traders, and investors into a decentralized, open and fair network, making the financial market even more global and interconnected. Genesis Vision constitutes the first platform to make a foray into the private trust management market, harnessing Blockchain technology and smart contracts. According to the Boston Consulting Group report Global Asset Management 2016, the total amount of funds in management is more than $70 trillion – the trust management market has grown rapidly for the past decade. In order to facilitate its development and longevity, the platform will look to crowdsourcing in the form of an ICO. The platform itself will emphasize a more globalized outlook, whereby successful traders can broadcast their trading strategies by attracting investments from around the world. 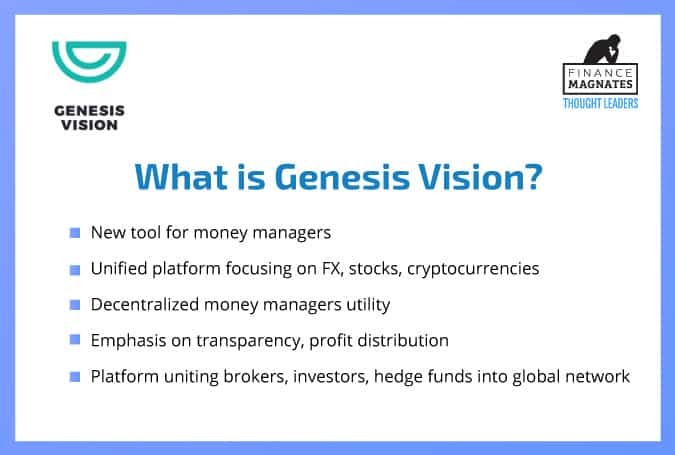 Genesis Vision itself was founded by a group of highly experienced and specialized veterans from across the financial industry. A collective understanding of financial markets has borne several fruitful partnerships with hundreds of brokerages, helping pave the way for the launch of Genesis Vision. The platform’s next phase will be procuring funding via an ICO, which will be integral in feeding and ultimately driving the development Genesis Vision. The decision to turn to crowdsourcing and an ICO campaign reflects one of the more commonly adopted strategies presently, with ICOs helping raise millions globally for fintechs and other venues. Genesis Vision’s ICO campaign is slated to begin on October 15, 2017, featuring a composite of lucrative bonuses for early participants. Genesis Vision’s early investment program will take place in the form of an options sale, rather than a traditional pre-ICO campaign. As such, options for the first 20 percent of the maximum options cap guarantee their holders a 30 percent bonus, with the next 30 percent receiving a 20 percent bonus –the remaining 50 percent receive a 10 percent bonus. Genesis Vision’s options sale will start later this month on September 15, 2017. Individuals interested in the bonus options or Genesis Vision’s platform are invited to read the whitepaper covering its ICO and all other elements of its development.